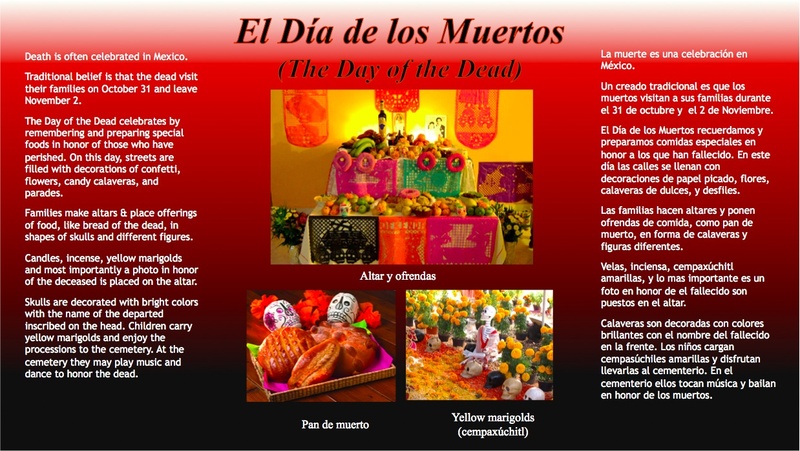 Dia de los Muertos…Different than Halloween? Today, as most of America knows it, is Halloween. Originated from the phrase, “All Hallow’s Eve,” Halloween is believed to have descended from a number of cultural traditions, including Christianized feasts and Celtic harvest festivals. Although it may have begun as a day to commemorate the death of loved ones, Halloween today is a opportunity for children dress up in costumes and go trick-or-treating through neighborhoods for candy. It has a “spooky” vibe about it, and other activities include carving pumpkins and making jack-o-lanterns. So…Dia de los Muertos is the same things except in Latino culture, right? Wrong! Dia de los Muertos (“Day of the Dead”) originated in Mexico and is widespread throughout Guatemala, Spain, Brazil, and many Mexican-American communities in the United States. Instead of being on October 31st, Dia de los Muertos is typically a two-day celebration that takes place over the 1st and 2nd of November (although some say it begins on the night of October 31st). While Halloween is supposed to be about honoring the deceased, Dia de los Muertos actually does so. Families typically gather to honor loved ones who have passed away, celebrating the lost by building altars in homes, schools, buildings. They will usually leave gifts such as chocolates, sugar skulls, marigolds, sweetbreads, and trinkets. They will also visit graves to give offerings and hold vigils with candle lights and photographs. While they may have their differences, both Halloween and Dia de los Muertos will be celebrated this weekend. If it were up to me, I’d create one mega-celebration where we could all eat tons of candy and celebrate our deceased loved ones and call it Dia de Halloween! !